I admit to throwing in a little red food coloring in my red velvet creations. Frosting? Yup, the rainbow reduced to little plastic squeeze bottles goes in there too. But there always seemed something so off about dying eggs for Easter in such a way. Though I’m neither a Christian nor a Jew, I grew up Catholic and have many beloved Jewish friends (and the culinary traditions are stellar). So the holidays of this time of year still mean, to me, a bit of a fresh start. The earth is starting to pour out beautiful things for us to eat again, and animals are popping out little ones by the baaa’ful (or neigh-ful or whatever). It’s a time of cleansing and self-reflection. So, I set to making an Easter egg that not only looks beautiful and delicate and natural, but actually has some flavor benefit as well. Because why dye the outside of the egg if, when putting together a holiday plate, you can color the part that you eat and infuse some new flavors too? My mind quickly turned to… tea. 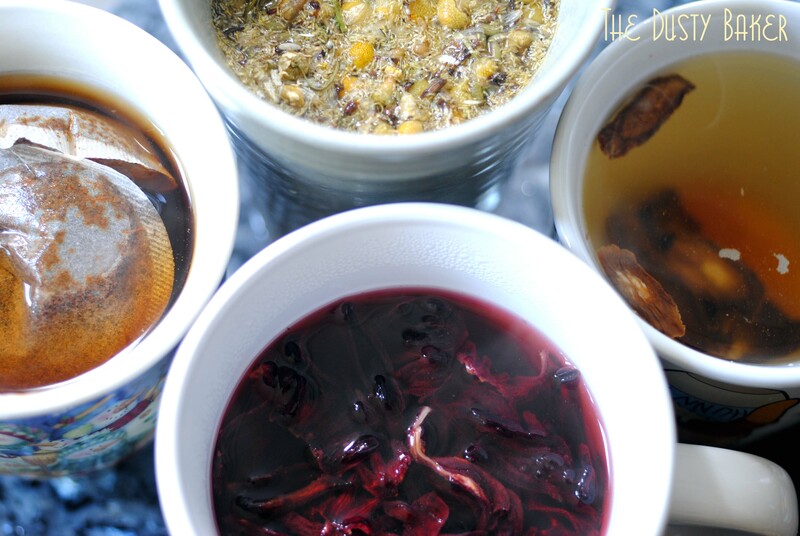 Clockwise from top: chamomile, burdock, hibiscus and raspberry Earl Grey teas. I drink a lot of tea. I own several items in which to brew it. I drink it by the potful as I type. One whole shelf of my (teeny tiny) pantry is devoted to it. I throw it into scones, cookies, cakes… delightfulness. But can it dye eggs? Various hues from the different teas. Yes, it can. Much more subtly (in the cracked, stain-glass versions) than bright pigments. 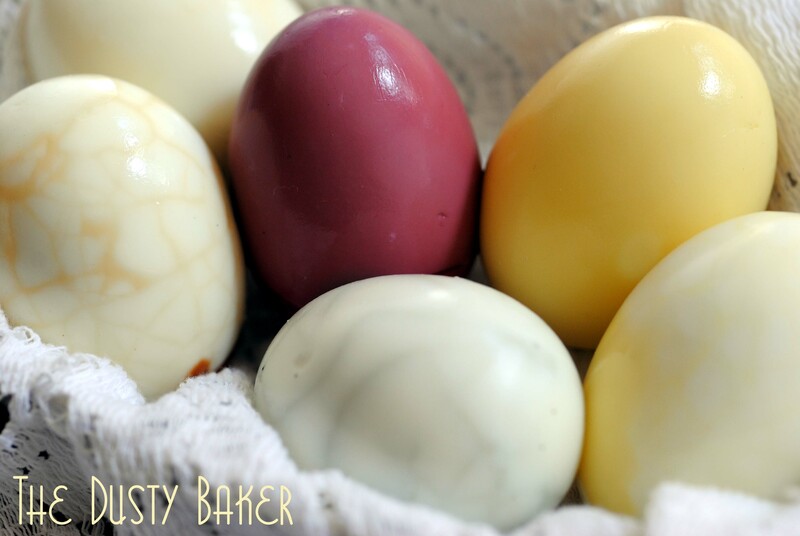 But the colors are so soft and delicate and would seem perfectly at home nestled in baskets on raffia amongst dark-chocolate bunnies (or whatever your tradition may be). I doubled each amount of tea and let the teas sit for 20 minutes, covered, to make sure they were at full strength. Burdock: I was disappointed that this didn’t do too much in the color department, but the deep, smoky flavor was quite lovely. Would probably work best with completely shelled eggs rather than the cracked version I tried. Hibiscus: Turned the shelled egg to a glorious purpley-red, and gave the cracked one dark purple/blue lines. I wonder how it would have been had I soaked it longer…? Raspberry Earl Grey: Gave clear, dark blue lines and an awesome flavor. Would be great to use on a salad with slivered almonds. Chamomile: I was surprised that it made the egg as yellow as it did! And the flavor was truly beautiful… fragrant and slightly sweet, like springtime! Place eggs in a pot and fill with water until it covers the eggs over by at least one inch. Bring up to a boil, then remove from heat, cover and let sit for 12 minutes. Immediately rinse eggs and run with cold water. The eggs can be put directly in the cooled tea once they’ve been strained and slightly cool. If made in a large enough mug, you can color three eggs at a time. Play around with shelling them completely or cracking them thoroughly to give the stained-glass-window affect. I let my eggs sit for about 75 minutes, but the longer they sit obviously the more they’ll color up. Occasionally stir them around for even coverage. These are adorable. It’s grown up Easter Eggs. I love it. Beautiful. I never thought of dying the actual egg and not the shell. Very inventive. I love these! How smart are you to remove the shells and then dye the eggs with tea! Oh such a better way to dye them than with chemicals. I can’t wait to try this out. Thanks! There was something that just felt right about doing it this way, and they taste so special too! Wow! That is genius! We like to have our eggs pickled, in leftover bread and butter pickle juice. I LOVE bread and butter pickles. What a brilliant idea. I haven’t done any pickling – have a feeling that will be changing soon! Yum! I don’t eat hard-cooked eggs, but I love the buttery color of the chamomile-dyed egg. What an absolutely wonderful idea… I’m impressed by the Chamomile too! I LOVE this post. Thanks FF! Sometimes simplicity is the best thing in the world, no? These are brilliant! I love the colors and the look of them. Can’t wait to try it!! Thank you so very much! That’s so RAD! What a brilliant idea! Love the marble effect and your choice of teas – especially the hibiscus and chamomile. Wow raspberry earl grey? That sounds amazing. I must try this with the kids this year for a change. Thank you for the inspiration and so glad I saw this via Foodbuzz today. Congrats on Top9! Thanks – the hibiscus’ color was just gorgeous and the chamomile TASTES so good! Wowed me on some gluten-free matzo with a little dry sheep cheese. Loveliness. Thanks! Beautiful eggs!! What a great idea to use teas…I’ll have to try that next time! I did some this morning & used beets, turmeric, paprika & cabbage. These eggs are so beautiful! I love this idea, I need to try making some for myself! Congrats on the Top 9 :)! I’ve always wanted to make tea eggs, and I’ve never gotten around to it. I’m not sure why — but I’m totally inspired by you lady. These are just lovely. This recipe reminds me of the tea eggs you can find in chinatown, and the Sephardic tradition of long-cooked eggs. They put tea, coffee, onions skins, and olive oil into the cooking water to color and flavor the eggs. I wonder what it would be like to cook the eggs in tea water?